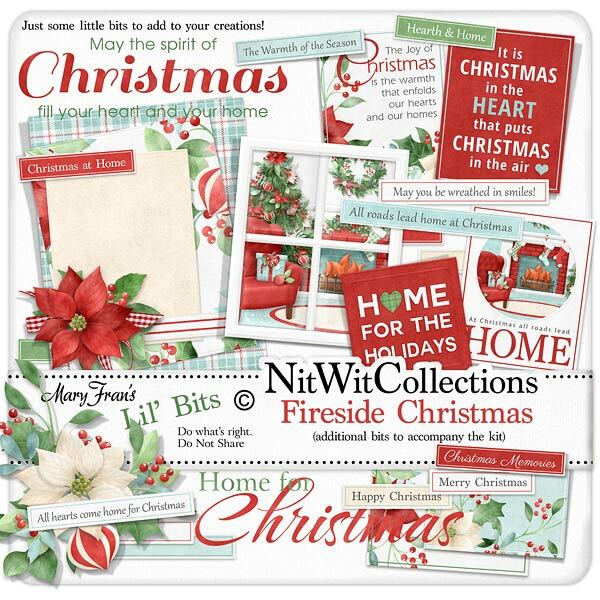 Lil' Bits "Fireside Christmas" gives you so many more options to create with when using this digital kit for your scrapbook layouts, mini albums and cards. Christmas journal cards with heartfelt sayings, cluster elements and sentiments make this additional digital element pack a must have! Don't miss out on these digital elements as they are not included in the FQB "Fireside Christmas" Collection so don't pass these by! 1 Journal card - "It is Christmas in the Heart...."
1 Journal card - "The Joy of Christmas is...."
1 Journal card - "At Christmas all roads lead to Home"
1 Journal card - "Home for the Holidays"
1 Sentiment - "May the Spirit of Christmas...."
1 Sentiment - "Home for Christmas"